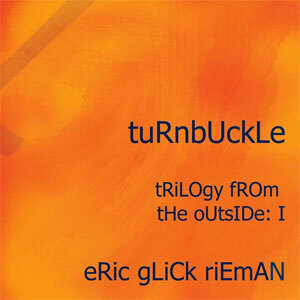 California-based composer and multi-instrumentist Eric Glick Rieman has played with a number of ensembles and as part of various collaborative projects in fields as diverse as jazz, rock, improvisation or modern classical. A classically trained pianist, he has also composed a number of experimental pieces for ensembles of various sizes, some involving scores created ‘in collaboration’ with animals. 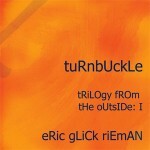 As a solo performer, Glick Rieman has been working with prepared and extended Rhodes electric pianos, which combined with more conventional acoustic instruments, have allowed his to experiments with incidental sounds and noises and integrate them within his music. 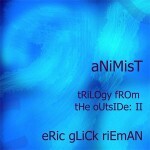 Seven years in the making and over two and a half hours in length, Trilogy From The Outside is a hefty piece of work to say the least, with at its core a prepared and extended Rhodes which is supplemented at various points with acoustic piano, celeste, melodica, Waterphone, an strange bowed instrument made of stainless steel and bronze which uses a small amount of water to create a exceptionally eerie timbre, and toy piano. The result is a particularly vibrant and surprisingly diverse collection of beautiful impressionist pieces which range from fairly short vignettes to sprawling epics and from subtle melodic moments to vast near-isolationist formations. To alter the sound of his Rhodes, Glick Rieman relies on a vast array of objects (anything from rubber washers, screws or marbles to rocks, bricks or metal rods) which he places within the mechanism of the instrument to create interesting resonances and noises, adding to the resulting sonic quality by using bows, wire brushes or mallets as well as the instrument’s keyboard. While each part was recorded separately, and the eighteen tracks presented here were culled from extensive recordings made since 2002, there is great consistency throughout, each piece evolving at its own pace, occasionally counting little rhythmic patterns, atonal fragments or recurring themes, yet all belonging to the same narrative. The mood remains pretty introspective throughout, yet Glick Rieman alternates between contemplative sequences, where the pool of sounds used is extremely restricted, and much richer moments where tiny noise speckles progressively gather into denser clusters to eventually form stunning textural motifs, while a distant piano or an ethereal celeste melody occasionally add an element of remote reality to a piece. 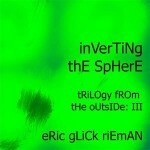 This fragile balance is maintained throughout the three parts of the trilogy, each section slipping effortlessly into the next. The rich variety of sounds and textures that Eric Glick Rieman manages to create from what is, to start with, a fairly constrained set up contributes to Trilogy From The Outside being an absolutely mesmerizing body of work. While there is a constant drone-line aspect to the basic sound structure of the record, which resonates from the first to the last piece, it is greatly enhanced by the treatment of Glick Rieman’s main instrument and the extreme attention to the most minute details. Ultimately this is a record to get lost deep into and one hard to leave behind.